Well, Sunday I had a leisurely morning around the hostel and eventually headed downtown for some brekkie. That’s right, brekkie. They really do cutesy everything up over here. You got your blueies and your salties and brekkie and Tassie and mozzies and so on. Why say something normal when you can make it sound so endearing? Anyway, brekkie was an expensive affair of a cup of coffee and two slices of french toast. I don’t understand how people eat out over here. Perhaps they only do it on special occasions cause there is no way you could do it every day, every meal like many people in the US do. That meal I described came to around $17 AUD. I decided right then it was time to embrace the backpacker and start making my own food. More on that later. With a (utterly not) full belly I started walking towards Echo Point, which is kind of the jumping off point for many of the walks and activities for the area. It turned out to be a longer walk than I expected so my muscles got nice and warmed up for the torturous day to come! I spent some time gawking at the incredible view at Echo Point and taking a bunch of pictures that completely failed to capture it. I keep seeing all these places where the landscape (or mountain-scape in this case) is just breathtaking and it just doesn’t fit on a camera. Oh well. Let me tell you, it’s gorgeous. I actually gasped when I came around the corner and saw the mountains spread out in front of me. Go there. I was feeling good and even though I hadn’t come prepped for a long walk I wandered over to the information stand to ask about some of the walks from this area. I had read about some of them in the LP (Lonely Planet) and in some of the stuff I had picked up when I arrived and I was interested in a few hour walk. The Giant Stairway sounded cool, but everything I had read made it sound too hard for my level of fitness, which can best be described as “mostly dead”. The information guy didn’t make it sound so bad so I decided to give it a try. As I walked down to the start of the Stairway I met two girls traveling from Jersey (the English one) and London and chatted with them for a few minutes. We walked and talked until the first set of steps which is where they gave up and turned back. I pushed on! Like a fool! As I climbed slowly down the nine hundred and something steps my thighs started to complain and I noticed just after the half way point that whenever I stopped for a second my legs were shaking. Not good. I eventually made it down to the last set of stairs where a woman and I guess her daughter were slowly going down… backwards. I have no idea why, but I assume it made it easier. Eventually I made the bottom and found a sign saying “Scenic Railway 2.5km —–>” and that’s where I was headed. Now it was time to see if I could make it that much further with my legs already complaining. I’ll cut this short a bit; I just noticed I am actually starting to bore myself. Anyway, I made it just fine, with a few much needed breaks. 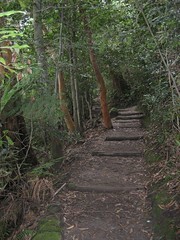 I entered Scenic World at the bottom of the valley and took the Sceniscender back up. 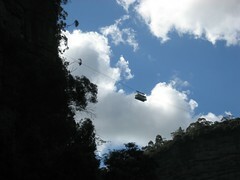 It’s a cable car that goes at an angle right up the cliff face and it was really sweet. There is also the Railway and the Skyway, which I decided to save for later. I had a lunch of yellow curry and rice ($18!!) at the top and then starting to try to figure out how to get back home. Unfortunately I had not planned well and ended up without a good way to get back to my hostel, which was now about another 3km away. Poor little legs. After limping back home and taking a shower I went grocery shopping for the first time; intent on not spending another $17 on a light meal. With french toast on the brain I picked up a loaf of bread, eggs, milk, syrup, peanut butter and jelly. All for about $12! When I got back I had lovely french toast with free hostel coffee. I figure it ran me about $1.50. Much better! So, that was Sunday. Monday I woke up and my legs were extremely pissed off. I took it easy all day. French toast for breakfast and then a little shopping. I found a used bookstore and picked up a few new (old) books for cheap and then had a lovely lunch of steamed rice and soy sauce (Mmmm!) for just $2.50. I was starting to get the hang of this budget thing. Anyway, today I did a lot of the same with a few notable exceptions. First stopped by a travel agent and booked a ticket for what I believe will be my last stop in Oz; Cairns! Cairns of the Great Barrier Reef and diving and beaches and tropical weather and all that. I have to get back to Sydney in the morning by train and then hop my flight up to Cairns where I will finally have to wear something besides jeans. After I booked my flight I headed back to Scenic World (taking a much shorter path) so that I could ride the Skyway, which is a cable car ride straight across the gorge and the Railway which is a miners coal rail converted for people fun. 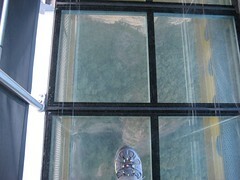 Both were spectacular and the Skyway even featured an LCD floor which was opaque when we started but turned clear half way into the ride. Over the gorge. Very, very scary and cool. A miserable, all up hill walk back to the hostel and some bad Chinese food later and I’m settled in for the night for an early morning. I walked up to the cinema earlier to see if there was anything good playing to waste the evening on, but it was Spiderman 3 (only) and I was two hours early. 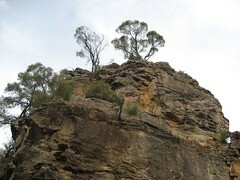 So that is my trip to the Blue Mountains of New South Wales! It may sound a little boring, but I’ve had a wonderful time. I really like it here. The town is very laid back, people are friendly, the scenery is amazing and the weather is nice. If I wasn’t so out of shape I’d like to have walked more in the mountains, but I’ll have to save it for next time. Tomorrow I am off to Queensland, sun, beaches and finally… dorm living. That’s right, I’m going to give up the last vestige of privacy and start living in the dorms. It’s either that or come back months early. I am spending too much every night just to sleep. So, see you in Cairns! Till then, check out the pictures! So do you plan on doing some diving while your there? I saw you that you mentioned it and I didn’t know if you were certified or not. If you do I hope you get some pictures. Sounds like your having a great time man. Thanks for sharing your travels. I had completely forgotten that you were going to document this journey. You should quit geeking and start publishing!!!! I called our mutual friend in Wilmington, but she had already logged on. Brat never said a word to me. Proud of you for gettin’ up and goin’…long overdue. Sorry we didn’t catch up before you left. Very awesome you are doing this! I’m proud of you and very jealous and have no doubt you are having a grand time. I’ll be logging in from time to time to share the journey. Thanks for blogging everything. Speaking of making your own food, has the thought crossed you to attempt local flavor? Check out some local cook books, and give them a shot. Certainly different ingredients are available as well as different methods of preparing them. So envious, I can only hope I get the chance to do something similar in my lifetime. Keep the blog going, enjoying it very much. Yeah, you should kill your own Koala Bear and bbq it! A little shrimp & bear on the barbie! Don’t forget the Vegamite Sandwich! I think it’s awesome what you are doing. I’m glad you are having a good time and smart enough to document your journey.